August is back-to-school month, and we all know what that means. The new school year means new clothes, shoes, school supplies and more. But part of preparing to go back to school, whether as a student, teacher, parent or caregiver, also means taking care of your mental health and well-being. As part of our #BeTheDifference campaign, we’re focusing on both students’ and teachers’ mental health all month long. Join the Twitter Chat on August 17 at 2 p.m. ET, with partners PROJECT 375 and Michi Marshall on Lessons Learned About Mental Health at School. Read our back-to-school mental health tips. In August we’ll be regularly posting blogs about dealing with mental health challenges at school—make sure to share them with your networks. 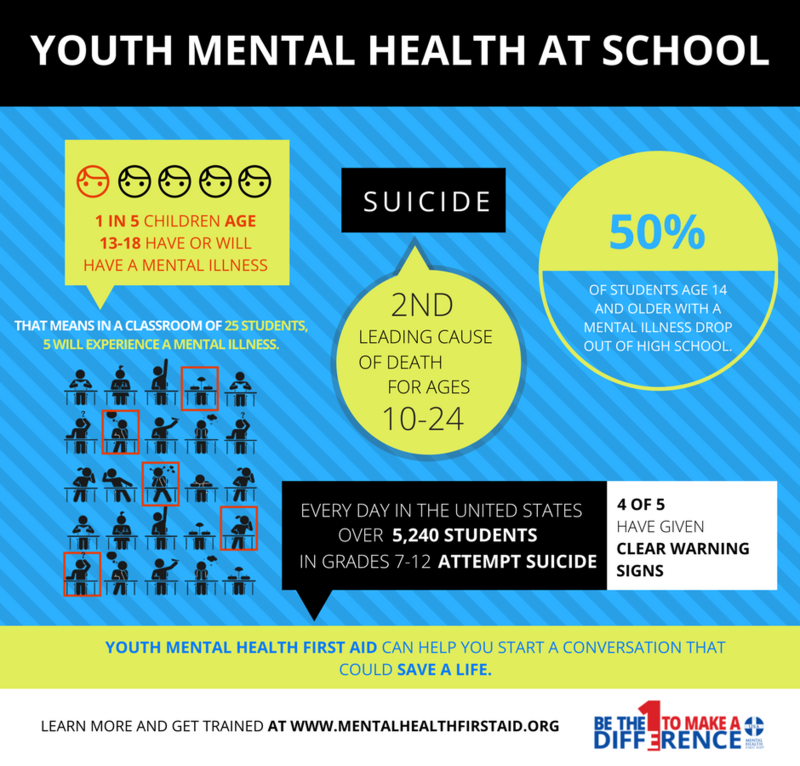 Share this infographic about youth mental health at school on social media and beyond! If you are trained in Mental Health First Aid and work in a school setting, or if you are an Instructor that trains school staff, email EricaH@TheNationalCouncil.org to share your story for a chance to be featured on the blog! During the transition back into the school year, students and teachers alike can face a variety of mental health challenges, so knowing how to recognize and provide assistance tailored to the individual’s needs is important. Thank you for being the difference in your community and spreading the word about Mental Health First Aid!